Written by 5SO Admin on 27 February 2011 . Wild Turkeys are very fast but their high bursts of energy usually last for only short periods of time or until they are out of danger. Gobblers (male) and hens (female) have been known to reach speeds north of 18 mph on the ground and have been clocked at 55 mph in the air. Their eyesight is impeccable due to their ability to see in the UV spectrum and can detect the slightest movement or color abnormality at great distances. Most turkey hunters do not place a high importance on scent control while hunting turkeys but research has shown the birds can still smell so some odor control is advised. A turkeys hearing is very acute and should be taken seriously. They can easily hear a soft tree turkey call 200 yards away on a calm morning. Now that you are a little more familiar with the advantages of your prey lets talk about the challenges when it comes to learning how to hunt turkey. Wild Turkeys are very fast but their high bursts of energy usually last for only short periods of time or until they are out of danger. They have been known to reach speeds north of 18 mph on the ground and have been clocked at 55 mph in the air. Their eyesight is impeccable due to their ability to see in the UV spectrum and can detect the slightest movement or color abnormality at great distances. Most hunters do not place a high importance on scent control while hunting turkeys but research has shown the birds can still smell so some odor control is advised. A turkeys hearing is very acute and should be taken seriously. They can easily hear a soft tree call 200yds away on a calm morning. Turkey hunting is all about stealth and limiting your movement. As an example of how well a turkey sees, if you use a gun that is not camouflaged, a turkey is more likely to spot you due to the metallic reflection of the gun. Another detail that can determine your effectiveness when learning how to turkey hunt, is your ability to use turkey calls and imitate a bird correctly. The jake (small male that typically does not gobble) or tom (mature male also called a gobbler or long-beard) is usually brought in by using the correct well rehearsed turkey calls. The gun you choose for turkey hunting will typically have a 26-30 inch barrel with a super full choke which will increase the density of your shot pattern. The gun should be camouflage if possible to limit the ability of your long-bearded target to pick you out from your surroundings. Shells vary from 2-3/4” to 3-1/2”and can have a large amount of recoil depending on the gun you shoot and the amount of shot loaded in each shell. Archery or bow hunting a turkey will be significantly more difficult since more movement is required to pull back the string and take aim. Try to limit the sheen of your bow by keeping it out of site until absolutely necessary. Broadhead selection should have special consideration depending on where you plan to shoot the turkey. If a body shot is planned, pick a broadhead that will not pass clean through the bird. This is contrary to other animals because you want to deliver as much stun power so the turkey does not fly away. A wounded gobbler has been known to fly up to a quarter of a mile after being shot by an arrow that passed cleanly through it. With little blood trail to follow, harvesting the long-beard becomes more difficult. If a head shot is planned choose a broadhead (like the guillotine) that supplies the most cutting surface to increase the likelihood of hitting your intended target point. Also, consider blade duration, just in case you do miss the bobbing head while first learning how to hunt turkey (thunder chicken). Fall- For Fall turkey hunting you need to locate the flock and then break the birds up. This entails running through the area and scaring the herd so the birds scatter. (Seriously.) You can then setup ~100 yards away and call the turkeys back in. Another tactic is to mimic two male turkeys fighting. This always draws spectators and other long-beards and gobblers who want to establish dominance. Spring- For Spring turkey hunting, location of the flock is just as critical. Turkeys are in their mating season and gobblers are on the prowl for a receptive hen. Using a locator call to get a tom to gobble to you to pinpoint his exact location is very helpful. After that use several of the hen calls to lure your thunder chicken to you and hopefully he’ll give you a show before you lay him to rest. Decoys can help calm and reassure the turkeys that what they hear is one of their peers. They should be placed in an open area at least twenty yards from your hunting spot (so you can breathe.) They help draw attention away from where you are located, thus giving you the extra edge you might need to get a shot. This is the part that needs practice in order to get it right. The twelve essential turkey calls and sounds made by gobblers and hens that you need to familiarize yourself with include: Assembly, Purr, Cluck, Cluck and Purr, Putt, Cutting Hen, Fly Down Cackle, Gobble, Kee Kee Run, Owl Hooting, Tree Call, and Hen Yelp. Using these turkey calls correctly can help you locate the birds and bring them in to you. Learning to differentiate between the calls is as critical as what time to use each turkey call. Time should be spent practicing to properly master the skills needed to be effective when learning how to hunt turkey. Assembly call (typically used in Fall turkey hunting) is used to bring scattered birds together. In the spring the hen uses the call as a series of loud yelps to assemble her flock or young poults. Purring is a soft, rolling call wild turkeys make when feeling content. 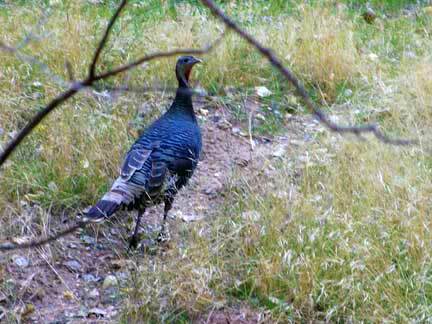 It can usually be heard by feeding turkeys and is good for reassuring turkeys as they get in close to your position. The Cluck consists of one or more short, crisp notes. The plain cluck, many times, includes two or three single note and is usually used by one bird to get the attention of another. It will also reassure an approaching gobbler that a female is waiting for him. The Cluck and Purr is a single note or notes often associated with flock talk or the feeling of contentment. It is sometimes amplified. It is a cluck followed by a rolling, almost vibrating like turkey call. The Putt is a single note, usually associated as an alarm. It could be several sharp or rapid notes and usually means they have seen or heard something they don’t like and are alerting others of the danger. Try to avoid hearing this in the woods. The Fly Down Cackle is typically made with movement. It can be heard when a bird is flying up or down from a tree, high spot, or object such as a river. A cackle usually consists of three to 10 un-uniform notes. It's a movement turkey call, so use it wisely and less often. Gobbling is used to locate a gobbler (caution should be taken as hunters may move in to your call). The gobble is one of the principal turkey calls of the male wild turkey and is used primarily in the spring to let hens know he is in the area. The Kee Kee Run is the lost call of young turkeys and variations of it are made by adult birds looking for others. It's often associated with fall hunting, but can be used successfully in the spring. A variation of the call, the kee kee run is merely a kee kee with a yelp at the end which adds a little flare to your speech. Owl Hooting is used to locate a gobbler early in the morning and to get them talking. The Tree Call is usually a series of soft muffled yelps given by a roosted bird that picks up in volume as the bird prepares to fly down. It is often used with soft clucking and is mostly a way to communicate with others in a flock. The Cutting Hen is a sequence of quick, loud, erratic single notes. Due to its intense delivery it can be heard quite a distance and lets other birds know the turkey is lonely. It's a slightly modified cluck that is short and quick and somewhat questioning nature since the bird is looking for company. 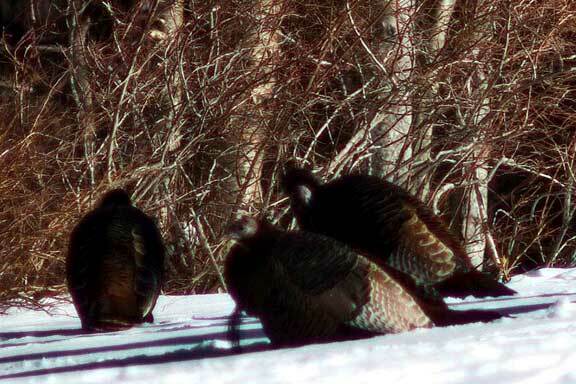 When taking aim at a wild turkey, remaining still and well hidden is more critical than with some other bird species. Movement should only be made if the gobbler is alone and or has his tail or other object blocking his field of vision (often difficult with multiple birds). The correct shot placement while learning how to turkey hunt would be to the head and neck for anyone using a shotgun or bow armed with a Guillotine broadhead. If turkey hunting with a standard broadhead, make sure to aim for the center mass of the bird’s body. Good luck with your turkey hunting endeavors and for any newbies, we hope this gave you a little more insight into how to hunt turkey!